The Lifecore Fitness Assault AirBike Classic Exercise Bike is Lifecore’s well built air bike for home use. This is our best-rated Fan-Air Bike Trainer. The Lifecore Assault bike will provide an excellent cardiovascular workout with low impact on your joints. Fan-Air bikes use air resistance to give you a great workout. The faster you pedal, the more resistance. The air from the 25-inch steel fan will cool you off while working out. The Lifecore Fitness Assault features a solid frame of high-tensile steel, and twenty sealed ball bearings for a smooth ride. Upper and lower body workout. For your comfort, you can set the six way adjustable seat fore and aft, up and down and tilt. As a cross trainer, you get a workout on both your arms and legs. 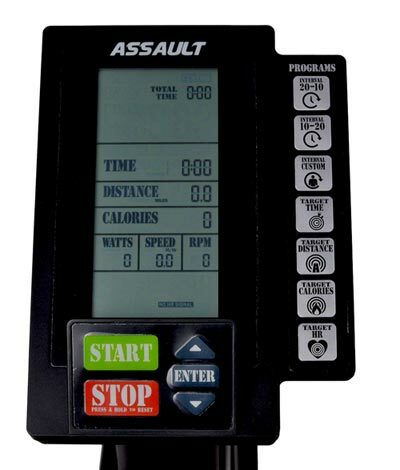 Lifecore Assault LCD Console Features: The console can monitor heart rate, speed, RPM, time, Watts and calories. The computer has motivational programs to enhance your workout (Tabata, Intervals, Watts, Heart Rate). The wireless heart receiver can use non-coded Polar heart rate chest strap transmitters. This model is compatible with Polar T31 and T34 chest transmitters, and you can set a target heart rate program. Smart-Review Commentary: The Lifecore Fitness Assault Air Bike Trainer is an excellent exercise bike for home use. It is extremely solid and well built with a steel frame and ball bearings throughout. This model has a large 25-inch fan to provide great resistance while pedaling. The Lifecore Assault model should fit the needs of most users, as its maximum user weight is 300 lbs. A computer console is provided that lets you monitor your progress, as well as heart rate. This model is Telemetry heart rate enabled (Polar chest strap available below). We feel that the Lifecore fan bike has the best build quality of any consumer fan bike. The Lifecore Assault has received excellent consumer reviews and is a Smart-Review Top Pick for exercise bikes. It is our best air bike for 2019. 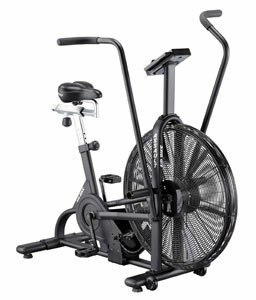 Description: The Lifecore Assualt Fan-Air Bike is a highly rated heavy duty cross trainer. With a strong steel frame, a 300 lb. weight capacity, large 25-inch fan, and six way adjustable seat, the Lifecore Assault will give you a terrific workout. The LCD console provides feedback on your workout. This model is a Smart-Review Top Pick.